We’ve covered Welcome to Rockville the last two years (2013, 2014) and we’re excited for this line up and bringing you guys coverage from this years festival as well! 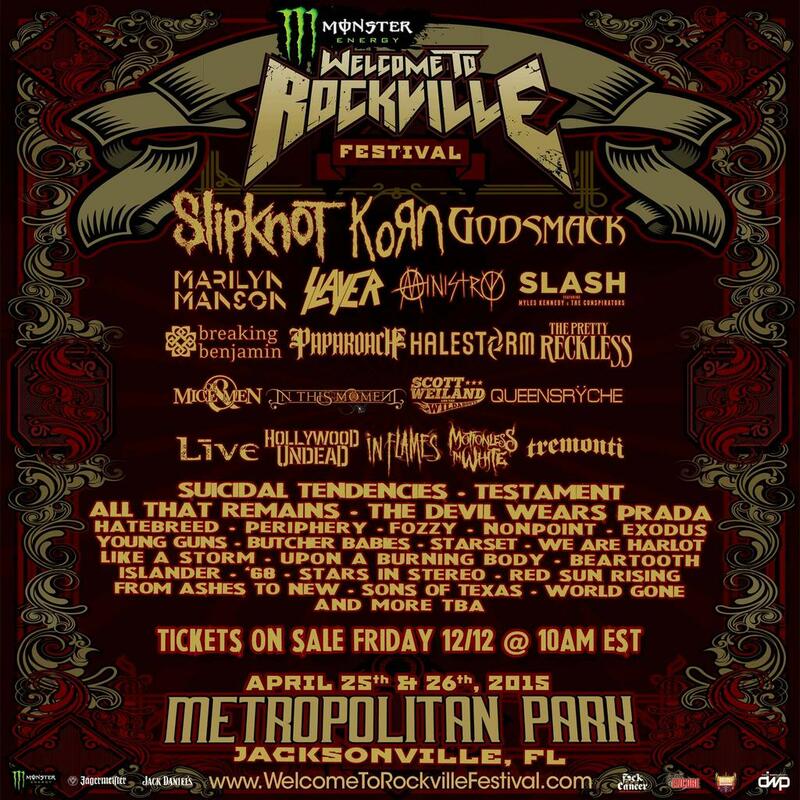 Monster Energy Welcome To Rockville will celebrate its fifth anniversary at Jacksonville, Florida’s scenic Metropolitan Park along the St. Johns River April 25 & 26 with a powerful rock lineup including Slipknot, Korn and Godsmack, along with Marilyn Manson, Slayer, Ministry, Slash featuring Myles Kennedy and The Conspirators, the triumphant return of Breaking Benjamin, Papa Roach, Halestorm, The Pretty Reckless, Of Mice & Men and many more (see below for full current band listing). Slipknot is touring in support of their #1 album .5: The Gray Chapter — the fifth studio album from the GRAMMY-winning group–with a live performance that will include their unique stage set and experience. Korn will celebrate the 20th anniversary of their iconic self-titled album–featuring their breakthrough hits “Blind” and “Shoots and Ladders”–at Monster Energy Welcome To Rockville by playing the album in its entirety. 21st century hard rock titans Godsmack have sold over 20 million records worldwide and are on the road in support of their sixth full length album 1000hp. Florida’s biggest rock festival kicks off the World’s Loudest Month festival series. The Monster Energy Welcome To Rockville discounted ticket pre-sale begins Tuesday, December 9 (see below for details) HERE. 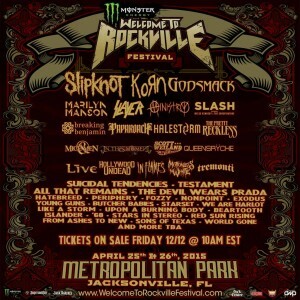 The current band lineup for Monster Energy Welcome To Rockville is as follows: Slipknot, Korn and Godsmack, along with Marilyn Manson, Slayer, Ministry, Slash featuring Myles Kennedy and The Conspirators, Breaking Benjamin, Papa Roach, Halestorm, The Pretty Reckless, Of Mice & Men, In This Moment, Scott Weiland and the Wildabouts, Queensrÿche, Live, Hollywood Undead, In Flames, Motionless In White, Tremonti, Suicidal Tendencies, Testament, All That Remains, The Devil Wears Prada, Hatebreed, Periphery, Fozzy, Nonpoint, Exodus, Young Guns, Butcher Babies, Starset, We Are Harlot, Like A Storm, Upon A Burning Body, Beartooth, Islander, ’68, Stars In Stereo, Red Sun Rising, From Ashes To New, Sons Of Texas, World Gone, with more to be announced. 2014’s Monster Energy Welcome To Rockville sold out with 40,000 fans of all ages from around the U.S. and various countries in attendance during the two-day destination music festival. Monster Energy Welcome To Rockville features music, band autograph signings, interactive experiences, a Monster Energy VIP area with beverage sampling, and a variety of food and beverage options, including local gourmet food trucks. New for 2015 is the Monster Energy Welcome To Rockville Tequila World, with a Mexican fiesta theme, featuring a wide range of tequilas, margaritas, tacos and more. Metalachi–the world’s first and only heavy metal mariachi band–will keep the party rolling with three performances on the Tequila World stage each day. Admission to this area is free and open to those 21 and up. The initial list of tequilas expected to be offered in the Monster Energy Welcome To Rockville Tequila World is as follows: Pura Vida, El Jimador, Luna Nueva, Jose Cuervo, 1800, Monte Alban, Corazon, Siete Leguas, Margaritaville, Lunazul, Don Julio, DeLeon, and Peligroso. A discounted ticket pre-sale for Monster Energy Welcome To Rockville is available from Tuesday, December 9 at 10:00 AM ET through Friday, December 12 at 9:59 AM ET. A password for access to the ticket pre-sale can be obtained HERE, local Florida, Georgia and Alabama rock radio stations, and select rock media outlets. Weekend VIP tickets are $224.50 throughout the pre-sale. Hotel packages will also be available for purchase during the Monster Energy Welcome To Rockville pre-sale. A limited number of tickets will also be available at select Metro PCS locations with no service fees during the pre-sale and general on-sale. As in the past, General Admission ticket discounts will also be available for active military through Monster Energy Welcome To Rockville partner GovX.